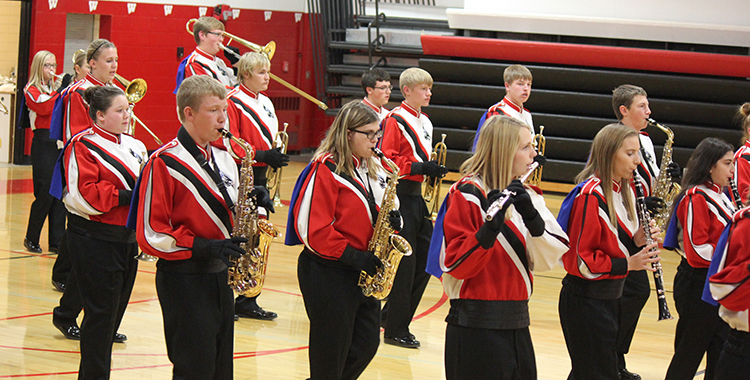 THE SCW band members, directed by Mr. Brett Kroeger, perform their “Shut Up and Dance” marching drill at their annual fall concert. The Sanborn Central Woonsocket Blackhawks Marching Band, under the direction of Mr. Brett Kroeger, presented their annual fall concert on Nov. 15. 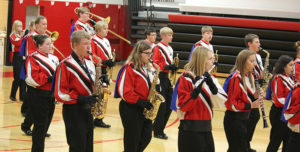 The concert opened with the band’s “Shut Up and Dance” audio performance, the song used for their competitive marching drill. The Sanborn Central woodwinds ensemble entertained with the “Justin Bieber Medley” followed by a lively “Uptown Funk” by the Woonsocket brass ensemble. The concert closed with a fun an impressive performance of the marching band’s competitive drill routine with the song “Shut Up and Dance,” which including the core band, drum line and color guard. Drum majors are Alissa Ball and Koby Larson, and colorguard captain is Breanne Brandenburg. The routine presented was used in the fall parade competitions in Chester and Menno. Upcoming events for the SCW Band are the Sanborn Central Christmas concert on Dec. 6 and the Woonsocket Christmas Concert on Dec. 13. …See more pictures in this week’s issue of the Sanborn Weekly Journal. 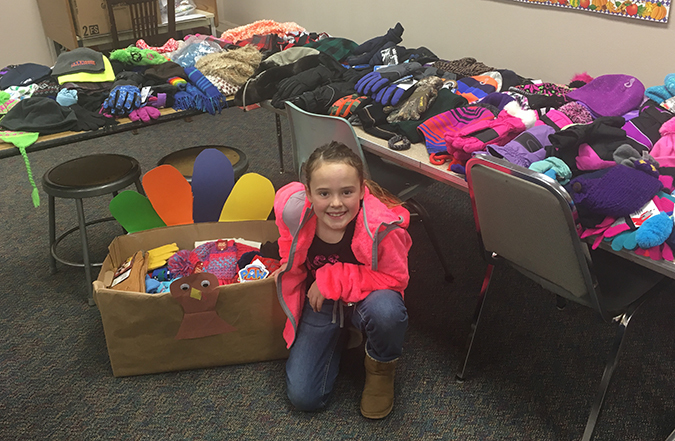 PICTURED IS Hope Baysinger with tables of donated gloves, hats and scarves. The Town ‘N Kountry Kids 4-H Club recently completed their “Stuff the Turkey” community service project. The idea was brought to the club by Hope Baysinger, a committee was appointed and the project was underway. The original idea was to collect food and toiletry items for the Sanborn County Food pantry, which then evolved to collecting new or gently used winter gear for all ages. Committee member Bailey Feistner worked with her sixth grade class and teacher Mrs. Rosemarie Delvaux to promote and assist with the project. Over 350 gloves, mittens, hats, coats and snowpants were donated through the school and Stuff the Turkey collection boxes at area businesses and churches. The donations were then distributed at the Woonsocket School. Any winter gear left over was donated to the Rosebud Indian Reservation. A box of donations was also delivered to the Sanborn County Food Pantry. 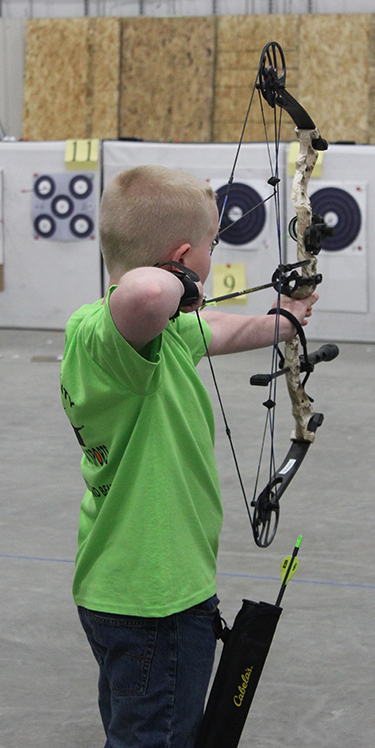 Rylan Grassel shoots in the compound archery discipline at the State 4-H Shoot this past year. The 2017 4-H Shooting Sports season will begin on Monday, Dec. 5, with a sign-up/safety night at the 4-H Building in Forestburg. Registrations will be completed, information about the shooting sports season will be provided, and complete safety training will be given. Registration will be open from 6:30-7 p.m., while a light supper is served. The information session and safety training will be from 7-8 p.m.
At least one parent should plan to attend with their child. Shooters must be at least age 8 by Jan. 1 and not turn 19 before Jan. 1. Cost for registration is $15 per shooter, which covers all ammunition and targets. Guns and archery equipment are provided. Participants may choose to shoot any or all of the following disciplines: BB gun, air pistol, air rifle, compound bow or recurve bow. Options for 22 rifle, 22 pistol and shotgun will also be discussed. Shooting Sports practice will begin on Sunday, Jan. 8, 2017, at 2 p.m., and regular practice will run 2-6 p.m. each Sunday through April. Participants are not required to be at every practice. The days and times that work best can be chosen. For more information, please contact Paula Linke at plinke@santel.net or 605-796-4558. If you are not able to attend the registration/safety night on Dec. 5, we can make other arrangements to get this completed during a practice session.